The world we live in is saturated in toxins that you absorb from the food you eat, the water you drink and the air you breathe. Your colon is designed to sift the nutrients from toxins but an overexposure of toxins can overwhelm your colon and cause it to weaken. This can cause you to experience symptoms like bloating, gas and constipation. 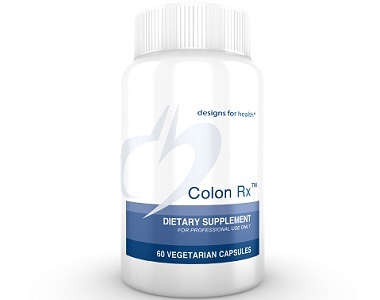 This review is going to take a closer look at Designs for Health Colon Rx. This product is a dietary supplement that is designed to be taken to improve bowel mobility and tonicity for those with occasional constipation. The manufacturer claims that this product can be taken for short periods of time for occasional constipation or as a daily bowel tonic to help strengthen and tonify the bowels. 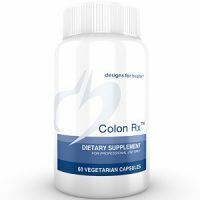 What’s in Designs for Health Colon Rx? Other Ingredients: Cellulose, mircocrystalline, vegetable stearate. Triphala is a traditional Ayurvedic herbal formulation. It is a natural antioxidant that can assist internal cleansing, maintain regularity, nourishes and rejuvenates issues and supports healthy digestion. It is most commonly known for its use as a bowel tonic that supports achieving regular bowel movements. Magnesium Hydroxide is a type of laxative known an oral osmotic. It absorbs water into the colon from the surrounding body tissues which allows for stools to pass easily. 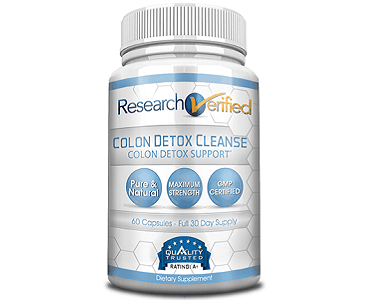 How Do You Use Designs for Health Colon Rx? The manufacturer recommends taking 2 capsules with a glass of water at bedtime or as otherwise instructed by your doctor. You can purchase this product directly from the manufacturer and from third-party retailers. One 60 capsule bottle costs $21.00 on the manufacturer’s website. They do not offer any bulk purchasing packages or discounts but that can vary according to the retailer you purchase from. We were unable to find a manufacturer’s guarantee. This means that if you purchase this product and it does not work for you or you experience adverse side effects, you cannot get your money back. This product appears to be a promising tool that can help you achieve regular and easy to pass bowel movements. It comes in easy to take capsules for convenience and contains two active ingredients that have been shown to contain properties that can help make achieving regular bowel movements easier. However, this product is not backed up by a manufacturer’s guarantee which suggests a lack of confidence from the manufacturer. This is consistent with consumer reviews because the reviews that we saw are mostly negative. Consumers claimed that this product is weak and does not work. You can take this product daily to help tonify and strengthen your bowels but the manufacturer does not offer any bulk purchasing packages or options to make it financially easier to take this over the course of an extended amount of time. You are better off purchasing a product that is backed up by a manufacturer’s guarantee for consumer protection and one that has positive consumer reviews.